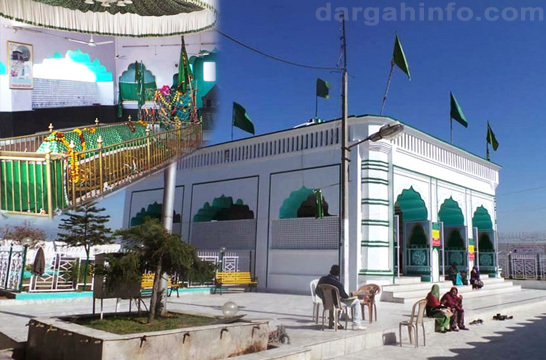 Hazrat Khwaja E Doura Ghouse Zama Makhdul Mashayakh Sultanul Auliya Alhaz Khwaja Muhammad Hasan Shah R.A.
Hazrat Sultanul Auliya R.A. was born on 1880 (1298 Hijri) Day Juma at Bhainsodi Sharif in city Rampur (U.P. INDIA) at that glorious day sunshine of Silsila E Abul-Ulayi and Jahangirya’s came with a glory in Rich place Ramzani. On birth of Hazrat Qibla, there was very happiness and joy in his family, because of he was first child in his Family, his father was so happy, because after many wishes he got a son and then season of feast started, and in this happiness MILADE MUBARAK and full month of Gyarhvi Sharif was expand in welcome of beloved of God, fully month fateha was organized of Shaikh Abdul Qaadir Jilani Peerane Peer Dastgeer R.A. When he goes out of home, so Durvesh and Auliya Allah take him in lap of themselves and sing Melodies of best wishes. Hazrat Qibla’s Parenting was being with this love and pride, and because of this, his name denominated Muhammad Hasan. When Hazrat became 4 years old then, Bismillah Khwani Organised, and Hazrat started to take education from village’s Imam Sahab. Hazrat’s manners, ethics and humility was outstanding and Praise worthy. In that round of time Religious and Educational Facility was not available villages, only some different cities and villages have center of art and education. Mind ability value was this, in age of 17-18 he learned Urdu, Arabic and Persian from teachers of villages, beginning of same Hazrat loves to elders, he used to service and care them. He Service to cool mind elders (Mast or Mastan – who has not relation or mean with actual world, they live in their own world of love and worship) give bath, feed them by self, like this had taken grace from elders in his childhood life. Hazrat’s father Mr. Hazrat Shaikh Ramzan Ali Sahab was a Very Gentle and honest person of village, he was a landlord of his time. He had a great business of textile. He always used to help of poors and orphans. His was very popular in his village because of his generosity. When any poor came to buy cloth of his daughter to married and if said, “I am poor and I am struggling in bad time”. Then He said brother take this fabric and do your daughter’s wedding, and give best wishes to them. He has this much everything also he expand a simple life. Hazrat also used work with his father, he used to market with a textile loaded bullock cart and sold/purchase intelligently and come back at evening. From childhood Hazrat was like go on Khanqahs and Dargah’s, he has no shortage of anything as well as business he also had well demesne. Hazrat used to sit on doors of elders with a unique passion. Hazrat met enough to elders but he didn’t find any satisfaction from heart and during that time he met Hazrat Mastan Shah Qalandar R.A., he service too much of Mastan Shah Qalander R.A. and and take grace from him after that he met Mursid E Kamil Peer E Tariqat Asad E Jahangiri Hazrat Khwaja Nabi Raza Shah R.A. take him in lapped of self and grace him from inside like that, Silsila of Hazrat is thriving till today, and Insha allah till doomsday it will be. The day when Hazrat become a disciple of Murshide kamil Hazrat Nabi Raza Shah on same day at night he seem in dream that Hazrat Nabi Raza Shah gave him a book that which wrote in Arabic in green color and said Miya read this is ‘ILM E LADUNI’ and uncountable praises Murshide Kamil Hazrat Nabi Raza shah get from my chest and divided in people and even I seen in dream Rose raining on me from sky and because of this dream Hazrat Sultanul Auliya’s Heart manner or condition had changed but during this all Hazrat Nabi Raza Shah had gone from earth and when Hazrat sultanul Auliya know this news he shocked that who will guide him now then he went out of home arrived on Chatgao (Bangladesh) and present in court of Grandmaster Huzur Fakhrul Aarefin Khwaja Abdul Hayi R.A. that time Huzur Fakhrul Aarefin Was Alive, at that time he cheer to Sultanul Auliya and said don’t panic one time of yours is going to come, this time I am forced in your matter. Few months he spent in Chatgao (Bangladesh) at Darbar E Jahangiri and after become rich from grace of Sultanul Auliya and came back to India and arrived Luknow at Dargah of Master (Peero Murshid Hazrat Nabi Raza Shah R.A.) and after that he arrived at Bhaisodi Sharif and there Hazrat Nabi Raza Shah’s brother Hazrat Khwaja Inayat Hasan Shah granted an owner of shrine (Sajjada Nashin) by Hazrat Fakhrul Aarefin R.A. and thereafter every caliphs accepted him as Sajjada Nashin, and again wave of love started in all caliphs and people and everyone started to Present in court of Hazrat Khwaja Inayat Hasan Shah and during that time Huzur Sultanul Auliya R.A. even arrived there in service of him and he service like that till now nothing any example of that Service. He Service around the clock and be busy in worships. In most travels many disciples with him and Hazrat Inayat Hasan shah extremely like to Hazrat Sultanul Auliya and in because of this bless which to him which he was searching. Hazrat Sultanul Auliya Caliphate on 1912 in Ajmer Sharif of court Huzur Garib Nawaz R.A. Sultanul Auliya told him “Huzur I don’t need to caliphate I want to service to door of murshid but Hazrat inayat hasan shah said with smile “ Sufi Ji please accept this then Hazrat Sultanul Auliya obeisance and obey and take that bless. After on high of caliphate, he went Agra with Murshide Mohtaram and there they arrive at the Dargah of Hazrat Sayyadna Amir Abul Ula Sarkar R.A. and after Attendant on there, they went luknow at the Dargah of Hazrat Nabi Raza Shah R.A. and after Attendant on there, they went Bhaisodi Sharif. One Night he seen that in dream, in sky one sedan is get off on land and when he removed the cushion of sedan 2 Lighted Face child set inside, he seem them to close so then Hazrat Khwaja Nabi Raza Shah was in face and second child face match with Hazrat Inayat Hasan R.A. and both face was getting exchange the faces. In Morrning he present on court of of Master (Peero Murshid) and he said before Hazrat Khwaja Inayat Hasan Shah R.A. Said “Sufi Ji i was not capable for that, this is blessing of him which made me of himself.” (Khwaja Inayat Hasan Shah Already know about the incident of night) he give a hug to Sultanul Auliya and permit to give a result to work of silsila. According to order of Master at first he went on court Kaliyar Sharif at Dargah of Hazrat Makhdoom Ali Ahmad Sabir Kaliyari R.A. and he started to work of Silsila From Jwalapur and thereafter a flood of came in silasila a jahangiri Many thousands of people became disciples of him, and India’s biggest cities and villages people became disciples of him and even today near of Pakistan’s villages many thousands of loving people and disciples of Sultanul Auliya, are living there. From Sultanul Auliya, Silsila get that highness, Silsila is thriving even till today. He built up many thousands of Khanqahs and that is settled till today, his caliphs and sajjadanashin (Owner of shrine) manifest there, many programmes also organize like Mehfile E Sima and Fateha Khwani as well as of ‘zikr E ilahi’. Hazrat’s wisal happened on the night of 5-6 Jamadil Awwal 1369 Hijri, he was doing zikr e Fasan Faas then he didn’t more and that time Hazrat Abrar Hasan Shah R.A. gave him Gusl (Bath) and when he was doing Antimony in eyes of Sultanul Auliya, eyes was reacting with antimony stick like a alive man. By order of Sajjadanashin Hazrat Shahide Millat Aziz Miya R.A., Hazrat Khwaja Abrar Hasan was accomplished the Namaz E Janaza and thousands of people whom relate to Silsila, came and be reach of grace, every year Urs of Sultanul Auliya Organize on 4-5-6-7 Jamadil Awwal at Murshid Nagar Bhisodi Sharif with full of pride and interest where Thousands people came in court of him and by attend they get rich grace (Faizane Jahangiri). Even Today Silsila of Sultanul Auliya is thriving with loud noise. Hazrat Sultanul Auliya caliphate and permit many people on high with blessing. And many people whom match not found till today, some people (Hazraat Name written Below in last, about which we will discuss next time in new style that how during following and love of master they leave everything and chose philanthropy [Khidmate Khalq (Service of people)] and created greenery in this flower garden by walked on path which guide by Master (Peerane Uzzam). By the way mostly caliphs has gone from earth now. But till today their Khanqahs (Hermitage) well settled on their place, and their Sajjadanashing (Owner of Shrine) Keep Working well.